After four years of parenting (or my version of it) I’ve learned that there are many things you think you need for your child but you really don’t. I don’t know why we think this – maybe because other people do things a certain way or maybe because the stores sell certain items so they must be necessary? For instance – one of the most stressful items we purchased for Mikayla (before she was born) was the crib bedding. We bought one set and then took it back after a week or so and then I scoured the internet searching for the perfect blend of cute and frugal bedding. The set we purchased included a sheet, crib bumper, quilt, mobile, “bed” skirt, valance. Do you want to guess how many of those items we ever actually used? That’s it. We used the sheet. Along with a couple other sheets I bought in addition for a much cheaper price. The crib bumper and bed skirt (crib skirt?) lasted until the first time I changed the sheets. It only took about twenty seven seconds to realize changing a crib sheet was way too much trouble by itself and there was no way I’d survive if I also had to fight the skirt and bumper. The valance was too small for our window. The quilt was cute and I did hang it on her wall – but it definitely wasn’t a necessity. And the mobile – we put it in her crib. How many times did she look at it? Probably twice. For pictures. Then we took it down because we kept hitting it with her head or our heads. The most stressful pre-baby purchase and we didn’t even use it. Ridiculous. Dear new parents, please don’t stress over crib bedding. Your baby will not care if he only has a sheet and blanket and it might save a few of your precious brain cells because after baby arrives you’ll need all you’ve got. Another thing we discovered we didn’t need? A second car seat. Baby car seats are the absolute worst things ever. I mean, I’m glad they keep babies safe and all but they are a pain to deal with in any way. Once it’s installed you should just consider it nailed down because taking it out for any reason will make you want to hurt someone. I knew this prior to having Mikayla. I’ve been around enough kids to know that car seats are horrible monsters sent to steal away whatever sanity poor parents cling to. So, I thought it’d be a lot better if we had a car seat in each car so that we never had to move it back and forth. But, really, we didn’t need this. I’m sure some families do, especially if both parents are working and share the pick up or drop off responsibilities. But for us, it wasn’t necessary. We used this car seat only a handful of times. And, really, it was a poorly designed seat. Once Mikayla reached about 25 lbs it was too small for her comfort. It sat up too straight and it was too tight on her legs (granted, she carried more of that 25 lbs. in her thighs than most toddlers). Just not the greatest carseat ever. 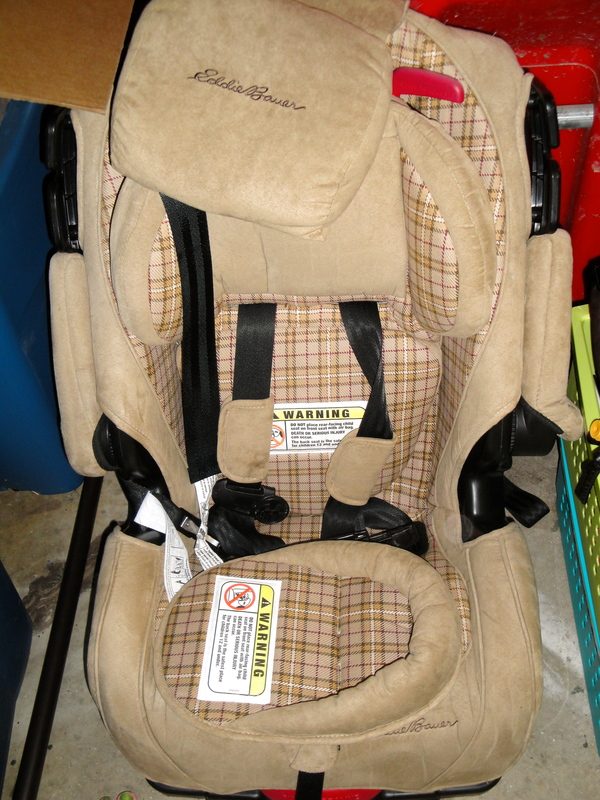 So, we cut our losses and sold the barely used carseat at the yardsale. What’s something you thought you absolutely had to have for baby that turned out to be less than useful?